Safflower is a member of the Asteracaea family also known as the daisy family, the botanical name is Carthamus tinctorius. This plant is often mistaken for saffron. 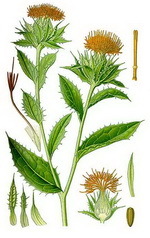 The flower is a stiff, thistle-like upright plant with a whitish stem that branches near the top. The leaves are serrated looking, oval, spiny, sharp-pointed with long tubular flowers that may be bright yellow, orange or red depending on the variety. The plant’s origin is not precisely known but it is believed to be native to Afghanistan and Egypt, while it is believed by others to have originated in India. The flower is cultivated in Australia, China, India, the Middle East, and South Africa for its oil called safflower oil. The flower which is about 1/100 the cost of saffron is often falsely sold as the much more costly saffron in most countries. When the two flowers are place side by side, it can be seen that the petals of the flower are more orange and with a wider, more angular shape than saffron which has long wire-like threads. The coloring ability is much like saffron, but the taste is different. When purchasing the real flower, it should be stored in an airtight packet in a cool, dark place. The florets of the flower are used mainly to color food just as saffron is, but at a fraction of the cost, and used as the polyunsaturated oil that is extracted from its seeds.